Time to ditch the smoke and mirrors approach? Due to a growing sense of disgruntlement amongst Villa supporters, today saw the publishing of an article on the official website under the headline of ‘Focused Lambert: We have a vision for the future of Villa’, that was a blatant PR attempt to say, ‘Don’t worry, Villa’s top trio have everything under control’. It doesn’t once actually explain what the vision is and just rolls out all of Lambert’s post-Swansea answers to journalist’s concerned questions with a positive spin. It’s PR at it’s most embarrassing and naive, something that has increasingly riled Villa supporters over the last few seasons. Remember the desperate attempts of posting endorsements of Alex McLeish by Sir Alex and co, to cover up a very unpopular appointment? That was only the tip of the iceberg, what with the weekly spinning of all player interviews after each defeat, promising how things will change. Now, most of us are behind Paul Lambert and want him to bring success to the club, but you have to question what we’ve seen taking place in front of our eyes this season. Regardless of the results (which aren’t great), the alarm bells are ringing just based on the team’s performances and style of play. For example, a quarter of the game’s possession against the likes of Southampton and Swansea. This does not bode well. I still respect and am hopeful about Lambert, especially if he gets the players in during the January transfer window that are blatantly needed, but Villa’s PR/editorial team really are not helping his cause by insulting the intelligence of the Villa fans with powder puff sentiment in articles like the one below. There is a way of presenting the same quotes in a more upfront and honest fashion (adding some actual substance would be a start), rather than taking the smoke and mirrors approach that only increases supporter’s resentment and frustration. Paul Lambert insists Villa’s top trio – including Randy Lerner and Paul Faulkner – have a shared vision for the future of Villa. Lambert, speaking after the 1-1 draw with Swansea, said the club was still in the very early stages of rebirth and renaissance under his leadership. ‘Very early stages of rebirth and renaissance’ – it’s been a season and a half. Paul Lambert is actually the 5th longest serving Premiership manager (one day behind Brendan Rogers i 4th). Renaissance? If Villa fail to beat Sunderland, then the club will have a worse record than from corresponding fixtures last season. That’s regression, not renaissance, in our book. He stressed that he knew when he took over little over 18 months ago that it wasn’t going to be a quick-fix, a belief held by the chairman and chief executive too. Maybe André Villas-Boas should have told his board that getting seven players in wasn’t going to offer a ‘quick-fix’. Ah, but maybe Daniel Levy has a bit more short-term ambition? In terms of Villa, most fans know we weren’t expected to be challenging for Europe in season two, but you expect improvement a season on, in the team’s play and also results. In short, hints that progress is being made and a ‘renaissance’ is actually taking place. But he said it was vital to “lay a brick” and build from there, with an unerring strength and determination. ‘A brick’? We need a whole wall, especially in defence. One brick – okay, that’ll be the purchase of Christian Benteke. What about other bricks? ‘Unerring strength’ – spare us the use of hyperbole. Geez, do you think Villa fans were born yesterday. 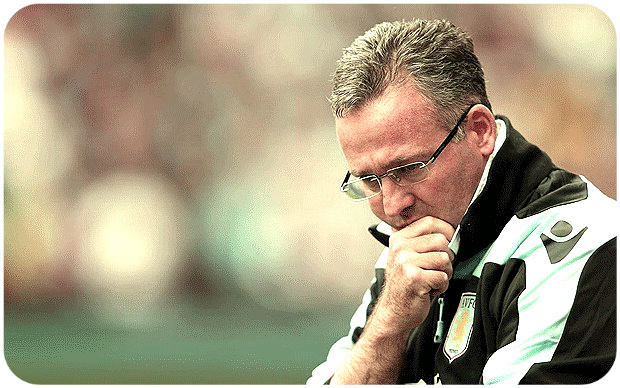 Lambert is no managerial titan, he is a manager Villa fans are starting to lose faith in. You’re setting him up for a fall. A more pragmatic approach would be appreciated. He said: “When you build something and go right into the roots of it, you know it will never be a quick fix, never in the month of Sundays! That’s what we have done. So what about the now? Is this an excuse for losing a League Cup semi-final against a League 2 team? Little has been done to make the team at least live up to the name Aston Villa in the short-term. Most fans appreciate that such a young and inexperienced team cannot be relied upon to be consistent, but if players don’t have the ability to be competitive in the now, what are they doing in a Villa shirt? “We have taken it right back. I have been supported in it by Randy and Paul. Potentially, Paul, right back to the standard of Villa in the period from 1986. “It’s a great challenge. And, believe it or not, I enjoy it. I’m glad someone is enjoying it. How many games have Villa fans really enjoyed at Villa Park in the last three years. Not that many. “You have to try and build it. Myself, Randy and Paul know exactly what is going on. Meanwhile, most Villa supporters don’t. We’re sorry, but it’s not entirely clear what this ‘long-term project’ is and what is expected at the end of the long-term rainbow? Please enlighten us. “You have to try to stick to your beliefs and do things as you see fit. “A football club has to have a vision through good times and bad times otherwise you keep going back to square one. You have to start somewhere and lay a brick. That’s what we have done. So what’s the vision? Is it the same vision when your team is regressing? Is the vision ‘the hoof’? “We have a plan. There’s a long road with it. It’s a challenge you relish. I relish it. Shall we leave you to it and come back when you’re ready? As we’re finding it really hard to pay money to watch some of the awful ‘football’ on display on this ‘long road’ at Villa Park. “We’re trying to build the club, build something lasting and that takes time. How long? Two decent midfielders would transform the potential of this team instantly. Stop farting around and get them in! “There is no question that we are evolving and developing as a squad. The questions seem to be getting louder though! “We believe in what we’re doing and trust one another within the group. “Our core strength will overcome the setbacks we face along the way, which are an inevitable part of the journey. Getting beat 8-0 by Chelsea, knocked out by old division 4 club in a cup semi-final and losing constantly to lesser Prem League teams are not an inevitable part of the journey. They are an avoidable part of the journey. Yes, you expect the odd slip-up, but they are too frequent to be entirely comfortable with what’s going on. “In terms of support, Randy has been excellent. He’s been great with me. “If you look at the way things were going last year, he stuck with it and his support was great. The Villa supporters stuck with it too and supported, but we’re a bit more clued up on football than our American owner and can spot there’s trouble this season due to the style of football and its lack of effectiveness on the pitch. “I am not sure he enjoys it all the time. He’d be like anyone on a rollercoaster, throwing up now and again. A lot of supporters have been throwing up a lot the past couple of months. Yes, but he’s not exactly done a good job in sport. The Cleveland Browns were terrible under his ownership. After taking over from his dad, the Browns recorded only one winning season in the nine full seasons under Randy Lerner. That’s why the fans called their stadium ‘The Factory of Sadness’. We’ve been supporting Aston Villa all our lives and really understand where the club should be. Villa’s current plight is down to Lerner if you look at the overall picture. So, again, what’s this ‘vision for the future of Villa’? How the hell can you have a vision without any aims and objectives? why does it take Lambert so long to realise our faults in the team when every Villa fan can see it instantly, he needed to do something after such an inept Villa team so against Swansea he made a couple of changes and for about 15-20 mins it was a little better we attacked them with vigor hassled them for the ball and stopped them settling down then he again decided lets retreat back into our own half knock a long ball up to a lone striker and give it back to the opposition to dominate play and then put all the players back on from the previous game who failed so miserable and throw away 3pts,do the decent thing Mr Lambert admit you are clueless tactically and F***K OFF AND LETS GET SOMEONE LIKE GLENN HODDLE WHO KNOWS HOW HE SHOULD PLAY THE GAME and let him spend some money on players who know how to play in the premiership during the tranfer window before its too late……….. I agree with most of the obvious flaws …. * for me being … A – STOP trying to win games with three! young! rookies! in midfield (we need 4 at minimum) … B – Get 2 up front (or 1-1)…. C – And keep the ball on ground! Let’s spend thirty quid a ticket to watch a brick. In eighteen months they have laid a brick. I don’t see a single brick in our team – plenty of turds mind. The biggest one is on the touchline. Most of us are behind Lambert I’d re-think that comment and comment and come up with another answer the right answer. Lambert is out of his depth and if allowed to carry on will relegate our once great club. Only a fool would be behind an even bigger fool. I think the supporters’ trust needs to engage in a massive fundraising effort and membership drive, and buy a controlling interest in the club. i don’t think this is really necessary we just need a fans representative as a non exec on the board. the threat of fans not going to the games is enough financial strength a minority shareholding dilutes this strength. Now let’s get this clear fans want to be told all PL tactics so that the opposition can work out tactics to to nullify them , and want to know what players the club is thinking of buying so that others can outbid Villa & buy them ? Or have I got that all wrong ? Sorry but I see a complete rebuild , as starting from the ground up with a skeleton of a team & then adding to it . No, I don’t think MOMS was asking for those kinds of details. He was asking for more information about the long term plan that Lerner, Faulkner, and Lambert are supposedly working from. Are they intentionally buying players like Helenius and Tonev who merely have “potential” but who clearly are not good enough for the Premier League right now? Or do they plan to turn Aston Villa into a training and selling club for a decade and hope to raise funds to transition into competing for top spots again 10-15 years down the road? Are they just trying to get the books squared so they can sell the club as a profitable venture? Basically, how many years until we should expect to have a winning record at home? How many until we should expect to have a winning record overall? What is the realistic estimate of when we will again be able to compete for a Champions League spot? Or dare we ask when we might win the league again? How many of the players we have now do they expect will still be part of one of those winning teams? We’re not asking for the tactics, just want to know the strategy. Exactly what Scott has just written. Spare us this ambiguous clap trap. What’s the actual goals of this ‘vision’, ‘long-term plan’ etc. As for tactics, the opposition doesn’t need much help in working them out! What have you actually seen of Helenius, expect for 45 minutes in the Capital Cup against Spuds, to make the judgement call he ‘clearly isn’t good enough’?? Somebody else made the comment, but I’m guessing because we haven’t seen much of Helenius, says it all really. Lambert prefers to bring on Bowery instead of him when making subs. Nuff said.